Bhaktas, This is your friendly neighbourhood baba spouting gyaan that is of no use and you will never need. That is probably the reason why only this space carries my teachings while my bearded saffron robe wearing counterparts make millions on television. This past week I have been involved in intense kundalini meditation, and I can feel my kundalini rise a few inches up my spine. For the uninformed, the Kundalini is a big thing in sad-dude circles and it’s proximity to the top of the head is a measure of our street-cred. In a layman’s terms the kundalini is like a golf handicap, the closer it is to the head, the bigger your reputation. We have an annual convention in the Himalayas where the pros(sad-dudes who have attained the sahsra chakra) compete and show off their mystical healing powers, very much like the PGA or Masters in golf. Once you break your meditation, your kundalini falls back to the bottom of the spine and has to be re-awakened, again very much like how rusty you get if you miss a few weeks on the links and your handicap shoots up! You may wonder why I risked the fall of an awakened kundalini to tell you a few silly golf analogies. My Bhaktas, this is far greater than that, and something that will unlock the mystery of our country’s growth as an economic superpower. Practice your swing and work on your stance, you can bring back your handicap to what it was and even improve on it, same goes with the kundalini. the ice ageregenerate a lost species from the ice age. You see I have been reading up on programming methods, OOP best practices, data structures etc not because I am looking to switch careers, that however cannot be entirely ruled out but for now, I am only interested for purely academic purposes. The one thing that I have gathered these days is that unless you are on television, no body gives an aerial fornication. While the 60 + age group markets have been captured by sad-dudes who excel at jaagarans, the 30-50 age bracket has been won over by sad-dudes promising ways to reduce stress, tension, blood pressure and even lymphosarcoma of the intestine in some cases. Now going after the 0-15 age bracket makes no sense unless one is a Physical Education instructor at a school. I don’t see much value in going after the 15-23 age bracket despite there being a huge avenue for exam fears, hypertension & suicidal tendencies, because I know jack excreta on helping with any of those. That leaves me only with the 23-30 age bracket and everyone there is in someway or the other involved with programming/code. I have therefore devoted part of my time to analyze their lifestyles and ways to blend spirituality & the scriptures into everyday life. You must be familiar with import directives, including header files and other declarations that are required at the beginning of any program across platforms. Your code doesn’t compile without it and the thing won’t budge unless you invoke the required headers. You see bhaktas, this is very similar to the invocation to my friend Ganesha and you cannot start any pooja/homam without that. Then comes the sankalpam which is more like a parameterized constructor/method/function that takes the date, location co-ordinates and occasion as arguments. Imagine there was a function like this that took those arguments and spat out mantras that you could recite. A lot of mantras I have observed, follow templates like this and that makes them very easy to code/recite. Further proof lies in the mantra pushpam which if you ask me is like a recursive function. It just calls itself with the names of all the elements from an array of some sort. Bhaktas, the more I look into these the clearer it becomes to me as to how modern day programming is closely integrated in structure to our mantras. If I were a spokesperson for the HJS, I’d probably extol the virtues of the mantras and how they gave rise to programming, like how the pushpak vimana inspired the Wright brothers or how mythological astras inspire modern day combat missiles. I’d instead appeal to my target audience and show them how cool the scriptures are and all that jazz, atleast that is the current plan. Let’s hope this catapults me into the league of television sad-dudes and prime time news channels invite me as a panellist for my views on the legitimacy of a military deal and the spiritual influences on the timing when said deal was signed. PS: If you are wondering who a sad-dude is, just say it aloud a couple of times. Dudyala Sri Lingeshwara Rama Vittalachari, commonly known as DSLR Vittalachari or just DSLR hails from a family of numerologists who’s clients have gone on to change the face of this world. His office is adorned by huge portraits of these legends who were living with the homeless in dark alleys and contemplating ending their lives owing to their creative failure, until the moment they were referred to someone from the Dudyala family. He loves to tell the story of Kallakuvel Sheshappa Iyer, a 16th century poet and playwright. Kallakuvel was fond of the English language he learnt from a voyager and against the king’s wishes, he wrote poetry in his new found love. Fearing certain banishment and even execution, Kalakkuvel was referred to DSLR Krishnamachari who suggested he shift base and sell his wares to British audiences. Crossing the seas was considered sacrilege within the Brahmin community, but that wasn’t the biggest of Sheshappa Iyer’s problems. He was least bothered of being ostracized from society but with a name like his, he stood no chance among the English greats of his generation. DSLR Krishnamachari had the answer and after some numerological calculations, he proposed to anglicize Iyer’s name. The rest we all know is history but not many however know that the rise of the greatest bard was attributed to the Dudyala family and several such stories have been lost between the pages of time. playing in-pin-safety-pinnot like playing in-pin-safety-pin where you keep counting down the alphabets and strike one out when you reach a zero. It involves serious calculations involving the positions of grahas, the latidude & longitudnal coordinates of a certain Soniaji and the total number of SMS votes on last nights NewsHour discussion with Arnab.“, DSLR thunders. He later told me that on the occasion of the stars birthday, DSLR offered him a discount on consultation fees and the star shall henceforth be known as DVGN Ajay. “These north indian names are very confusing, they don’t append the name of their village or their fathers name. They just use a silly surname like Singh, Sharma or Dixit thereby having no way to tell where you are from or which ancestral tree you belong to.“. We hope this new name works out for Mr.DVGN Ajay and also improve his likeability in Tollywood thereby not requiring him to act in sorry remakes, but the original vernacular versions themselves. We have also learnt that two budding stars of the Hindi film industry had approached DSLR for his services. While he wouldn’t tell us we have unconfirmed reports that tell us the youths have been advised to change their names to PRTK BBR & SHD KPR. The reason we’re told for this un-voweling of both first and last names, is that their shocking lack of any talent. in his own words, “Even mannequins have more facial expressions than them. These fellows cannot even be used as props on stage in a play“. Vittalachari hopes that this way atleast their movies may click, else he’ll have to resort to the last option wherein their names will just have one alphabet. Inspired by the movie MIB, these so-called stars may have to go about only as P & S but we will have to wait to see how the current experiment first goes. Again, these are only unconfirmed reports, but it is not like you care or that has ever mattered to anyone before. This extended India trip has been fruitful in many ways, working after lunch through dinner gives me the morning to pursue side projects and write a lot more often. I’ve also being going around and meeting interesting folks which has been a very interesting experience. I say interesting because I’ve met some awesome people who make me pick up my jaw from the floor when I see the things they do. There have also been people who make me laugh so bad to see their heads stuck in their bottoms. I’m glad I’ve seen more of the latter which gives me enough material to make jokes to tell others and write in this space. Let me assure you that this isn’t another NRI rant about rising prices, overrated food in swanky places, the increasing divide between the middles classes, and how I have to cross the Tamil Nadu border for a bottle of ThumsUp! Yes I am a ThumsUp boy & if you have a problem with that then please go back to sipping your ginger-lime-soda that you just paid 100 bucks for. not re?Why for you if-u I am putting any accent-u or not re?‘ After that outburst from Sripal Bommidi in VIth standard, I never made fun of anyone’s English or accent . Not because I was scared but because I felt remorseful on learning that his father owned a cycle shop and working extra hours to put him through school. My heart goes out to someone struggling to speak in English for they are at least making a sincere attempt, but my rage boils like Kratos in God of War when I hear a fake accent. Two weeks ago I was with friends having breakfast on a nice Sunday morning when all of a sudden this voice from the next table made me choke on my idli. ‘Can I have one podi dowza and one onion dowza please?‘ That wasn’t a typo, while playing with her hair with one hand and the menu in the other this lady was indeed calling it a do-w-za! I wish I could channel my inner Shivaji Maharaj or Bhagat Singh, but to keep up with the sentiments of this blog I’ll just use messers Parasurama & Narasimha. After that the same fluffy idli tasted like stale 2-day old roti and the surreal upma like cement. I sprang from my chair to see Narasimha emerge out of a pillar. The fiery avataram pulled her tongue out with one hand; the other went straight for her larynx, cleaned both of them with sambar and put them back where they belong. Yes the scene played out exactly as described above, in my head ofcourse. After that for the next 15mins, I had to endure how crispy her dowzas were and wait from my friends to finish their meal. Last week I was accompanying the begum to FabIndia to exchange something she had bought. Truth be told, FabIndia isn’t one of my favorite stores but I’m always amazed at what they can do with discarded curtain clothamazed at what they can do with discarded curtain cloth. We probably picked the wrong day for it seemed like we had walked into the congregation of T.Nagar-fake-accents-association. Remember that scene in the sixth sense where the kid keeps hearing voices, same situation, characters changed! No zombies or the undead, these were real people extolling the virtues of the fabrics they were trying out in the fakest of fake accents. The dowza lady in the earlier encounter probably could have been silenced with #OneTightSlap but this was huge crowd! Parasurama came flying through the large window and tearing the dusty curtain in the process. Before I could finish saying Deivame, he went about hacking everyone’s tongue with his axe and disappeared just like that leaving behind a bloodbath. Again this is how the scene played out in my head and it is my story so I’ll narrate it the way I want to, if you did not like it then please go take a shower with that avocado flavor hand-made soap that you bought from FabIndia. While we are still on FabIndia here’s a tip to ensure that those kurtas stay forever, DO NOT EVER TRY TO WASH THEM. If the stink from repeated wear bothers you then pour a few drops of perfume with water in a holi pichkari and spray on the fabric. Then blow dry with a vacuum cleaner or hair dryer and hand it indoors away from sunlight. This, my friends is the tried and tested way to ensure longevity of FabIndia fabric! Humor is a great way to diffuse an awkward situation, break the ice, get away with something both at home and work. Twitter and before that the blogworld have introduced me to some awesome people who could say something funny and even get away with murder. Sadly there are hajaar wannabe folks who in their quest to grab attention by being funny fail at aping these greats. The safest way is to be subtle with satire unless you have the slapstick comedic genius of Raju Shrivastav. I have learnt that being subtle though it may appear to be pretty simple isn’t true for many; the best example is my friend Komineni Venkatesh from EEE in college. In the electrical machines lab, he suffered a very mild electric shock while dealing with some faulty equipment. While most of us would have just jumped back, put the finger in our mouth waiting for the tingling feeling to go away, Venkatesh decided to play it a bit differently. He had heard of how a IInd year mechanical student cut himself in the lathe lab and evoked sympathy from all the ladies in his batch. Imagine this response in mechanical where anything remotely feminine is considered to be am item bombanything remotely feminine is considered to be am item bomb, EEE boasted of the best ladies in college! Venkatesh fell on the ground wriggling in pain crying for help and started the entire lab. Despite not being able to witness this in person, I have been told that the scene was very similar to a severed tail of a lizard wriggling to distract attention. Aiyo edukondalavada Venkatesh, subtlety #FAIL. Sadly today there has been an explosion of so-called funny people on twitter with their set of slavish fans giving them titles like the ‘Funniest 27yr old in Sankarankovil’ etc. So the stuff like ‘Gandhiji ki dhoti main ___’ that I became famous for in IIIrd standard is used heavily by a few. One mustn’t blame them entirely, they are burdened by the expectation of coming up with something funny and resort to stale and even unfunny so-called jokes. For those of you who have no clue what the Gandhiji ki Dhoti main joke is, kindly replace the blank with the name of a film. For example Gandhiji ki dhoti main sholay, Gandhiji ki dhoti main sailaab, Gandhiji ki dhoti main kala patthar etc. Unfortunately these were funny at one point of time, & I was very famous for such jokes. If you still find them funny then go ahead and tweet, no credit required. The world is a crazy place, everybody and by that I mean even that retired bank manager who lives next to the Saravana Bhavan in Vadapalani, wants their share of the pudding. If I had my way, I’d give them a share of pudingi instead. With the disastrous Australian tour, most of the articles we’ve published or received have been attacking the team, talking of strong measures, young blood, and making sepak-takraw the new national sport. Lucky for us and especially me, since I’m the one sifting through thousands of emails during commentary & weeding out troll comments on articles, ‘The Dravidirement’ happened. For many it might sound just like like another cricketer calling it a day, but here at cricinfo, it is the equivalent of Santa Claus flying a kite armed with a Laxmi bomb into a giant Raavan effigy!. Every columnist, editor, and even the chaiwalla has a RSD tribute in their drafts. Right after Ganguly bowed out in Nov-08, we began writing Dravid & Laxman pieces, editing them whenever they scored or failed, picking up lines from books and saving them for use in either of these career obituaries. Just when we felt that an announcement would be around the corner & proof read our articles, they’d score a 100 or a 50 and regale the selectors. iota of moral fibrerabid Sachin fan without an iota of moral fibre and someone who switches the TV off the moment his idol is gone. OK maybe I am, but who isn’t? Before I meander into singing paeans to the diminutive genius let me curb my enthusiasm this one time. All through his life Rahul Sharad Dravid has had to live in the shadows of a fellow achiever, let me give him his space atleast in my rant. 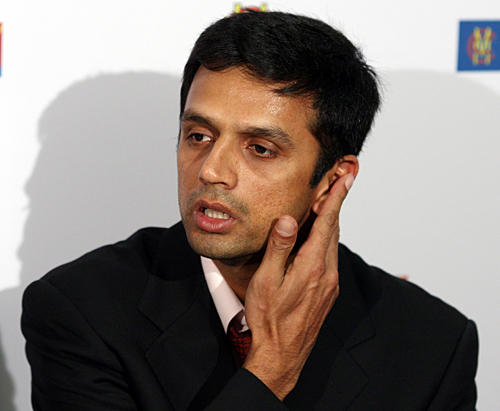 Yes this is a rant, because our chief editor #unselected my tribute in favour of Mrs.Dravid. The tribute that I had dressed up so very well, recollecting the first time I shook hands with Dravid when he came to inaugurate the Sri Lalitha Jewellers store near my house. I even had pics of my sister kissing his poster on the wall and professing her undying love for him. She married a die-hard sachin fan, and RSD once again lost to SRT because along with her gothram, her cricket loyalties also changed. Coming back to Dravid, I still cannot believe that they would choose the emotional tribute by a sportsman’s wife over a masterpiece that was written over a period of two years by staff member! In the immortal words of my second favourite sniffler/sun-gazer/cricketer Kris Srikkkkanth I would like to tell Vijeeta Dravid, Boss you just shut up nowBoss you just shut up now. Either be happy that your husband will be home now to get groceries, take the kids to school, ensure they finish their homework on time while you visit the spa & kitty parties. Or be sad that he will be around all the time, asking you stupid questions like why tomatoes are 23rs/kg and how to identify tender okra by breaking their tails. Your husband your life, what goes my father, but why you are kicking on the stomachs of poor editors like us? What about the hajaar retweets my article would have gotten on Twitter and the countless likes & shares on Facebook? So many girls would have sent me friend requests and fawned over my profile pics, my follower count would have gone past bladewallah & who knows even CBag! But no, none of that will happen as all my dreams have been squashed by that useless stupid wife of RSD. unfortunate oneto use inky pinky ponky & select the unfortunate one to write the mandatory report. The rest of us just googled for pics of his wife and compiled a ppt for internal circulation, while one chap was querying statsguru to compile the report. There was another guy called Rohan Jaivishwa who retired this year, he didn’t even have a player profile until we realised that he was Sunil Gavaskar’s son! I feel for the old man, he named his kid after three greats and the poor kid couldn’t even make it to the state team! #NoteToSelf: If you ever become famous cricketer, don’t let your son take up the game, for very few have gone to emulate their dads. The Dravid tributes are pouring in and ever since we let a civilian/non-staff-member like Vijeeta write one, the mother-sister of the cricinfo mailbox have been integrated. Last week we received one such tribute from a Mr.Trivedi, I failed to see how he was even remotely connected to Dravid. My boss however received word from government sources that he was the Minister for Railways & we had no choice but to schedule it to be published over the weekend. The very next day another tribute came in via post from a lady who wished to identify herself only as MB and the hand written letter was full of kisses. Diary, after the Vijeeta incident and the Rail Minister’s tribute I was ready to approve even my bai’s tribute to be published. This passionate tribute however was for a guy named ‘Drobidh‘ whom this lady fell in love with at Eden Gardens. Statsguru had no record of any such player and I had a haunch that it may have been one of our journos/photogs covering a game at Eden Gardens. I scanned and sent the letter to our internal mailing list list and forgot about it thereafter. Turns out she is a Chief Minister and got to know from her sources that her piece was #unselected while the Rail Ministers piece was okayed to be published. Turmoil in the government, chaos in Parliament over a cricinfo tribute but for political reasons they wish to disguise it as a fight against price-rise! Deivame, I have been shitting bricks all weekend and stand to lose my job. I don’t even sleep in the direction of Bengal & have been having nightmares of Mamata Bannerjee chasing me as Kali. We were able to stop the Trivedi article from getting published, but boss says the damage has already been done. Ayyayo, also some saalekuttekameeneneechpaapiharamilucchalafanga has leaked the Mamata Didi letter on the internet with all the kisses and horrible bong spelling. Even Dada who was all praise for an article I wrote after his comeback innings in South Africa may not be able to help me. If I don’t update this space, you probably know what happened to me. Thank god, SRT’s wife cannot write! JMS Pand finds a strange looking ring with an inscription in his grandfathers ancestral heirloom. The ring is believed to be the nose ring of the demon mahishasura and must be destroyed by throwing it into the makaravillaku in Sabarimala. Ganesh Damodaran, a friend of Pand’s grandfather consults with a seer Saruggan who turns rogue and wants the nose ring for himself. His plan to capture Gandoo turns unsuccessful and he summons his zombie vixen to hunt the boys down and retrieve the ring. Pand embarks on a journey along with his gardener Samrat Reddy and is ambushed by one of Saruggan’s vixen who wounds him before they escape with the help of a truck driver Arumugam. Ellurandhu an ayurvedic practioner cures Pand and also helps Gandoo put together a team which will protect the ring till it can be destroyed at its destination. Gollapudi Mahesh was a cashier with the State Bank of Hyderabad, Vizag Branch. Bored with his mundane life he was always eavesdropping on his neighbour Bilahari Basavaiyya’s excavations and longed for a life like that. When he heard about the nose ring, he couldn’t resist the urge to follow them and was taken over by greed to own the ring and keep it for himself. Gollapudi secretly kept following Pand Sam through their journey on his trusted Bajaj M80 and watched fom a distance as they were attacked by the vixen. He was dismayed to know that Pand were now joined by other to forma gumbal making it even difficult to get teh ring for himself. He however decided to keep following them like a shadow and waiting for the right moment to ambush them and claim the ring that was calling out to him. The gumbal meanwhile continued their journey towards Sabarimala and decided to halt at Thiruthani. “Dora, why for you want to walk through jungle like this Dora? Temple is on hill means we have to camp here only a?“. The gumbal was at first distraught at the loss of Gandoo Thatha, but then they tried getting over it for he was after all in a happy place. They set out towards kanchipuram. En-route Pand had an epiphany that the Gumbal may not be able to protect him all through the journey and the realization that he may be alone on some part of the journey sunk in. Meanwhile Bhramaji was seduced by the power of the ring and dreamt of all that he could achieve by possessing it. “Gandoo Thatha says that the power of the demon Mahishasura was in this nose ring, and the moment the goddess sliced his nose he became weak & feeble thereby killing him was a mere formality. If that is to be believed then the wearer will be able to gorge on a thousand pootharekulus and still be hungry for more.” Pand’s eyes gleamed in joy as he smacked his lips. “shaddap gilma smash! how you take ring from Pand babu“. #OneTightSlap from Gilma was enough to knock the wind out of Bhramaji and brought him to his senses. Ashamed of his actions he stayed silent for the remainder of the journey waiting for an opportunity to redeem himself. of zombie item dancersRocky Savant and her army of zombie item dancers. Armed with spears and fangs, they were not even remotely seductive but Rocky Savant was a different beast. Aptly named after her manly physique and ripping biceps, she was adept at item-dances and her killing move of seduction was bone chillingly named the classic dance of love. It had thrown many strong willed men into a state of trance after which Savant deftly made her move by digging her talons into the jugular. The gumbal shat themselves at the prospect of having to face her but Bhramjai saw it as the best chance to redeem himself. Pand & Sam broke away from the group making a dash for a famous matt in kanchi and the other members of the gumbal threw themselves upon the vixens, leaving Bhramaji to engage Rocky Savant. It was once of the ugliest battles ever as they agreed to a dance-off and it was the worst in history. Savant brought her best game and that involved hideous gyrations involving various body parts. Bhramaji you would think would have opted for some kathakali, but instead he began shaking vigorously giving the impression he was bit by a tarantula and sweating out the venom. They matched each other step for step and the duel continued into teh wee hours of the morning. Severely turned-off by Bramaji’s repugnant personality, Savant’s moves backfired and in what can only be called as reverse-seduction, Sanvant self-combusted into flames. The battle may have been won but a warrior was lost. The Gumbal decided to continue the journey to protect find Sam & Pand and seek help from other allies to prepare for the great war that would eventually decide if good prevailed over evil or otherwise. PS: Writing this three part story has been very tiring, I don’t think I’ll attempt the other two books. Guessing by the lukewarm response, it seems the right thing to do as well. Hello ji, are you a celebrity or do you think that you are one? Have you met the Kannagi of the west, Oprah? No? Don’t worry. Now arranging a meet might not be that easy, so are you good at photoshop or do you atleast know someone who can do the required imagery for you? Nevermind if you don’t, can you atleast find a gossip-hungry journalist? Find one & give him/her a sound-byte on how Oprah inspired you during you school years. Even better if you are a ladies, then you can claim that she was your role model growing up. Atleast write a blogpost or even a tweet on how she has shaped your outlook towards oppression against women and little girls all over the world must look up to her. Doesn’t matter if you are in Kumbakonam, Rajamundry or even Thrissur, you can still claim that your cousin in the states met her at a mall where she greeted everyone with her motherly warmth.